Dexter Daily: Which Actors Would You Like to See In Season 7? Which Actors Would You Like to See In Season 7? Warning! The following post may contain spoilers about characters of the seventh season. 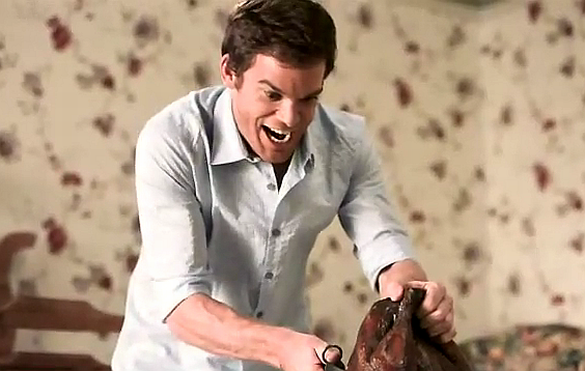 Dexter Season 7 begins filming on May 23 and it's still unknown which are the other characters to join the show. On April 24 it was officially announced that Ray Stevenson joins Dexter as [SPOILER ALERT]: Isaac, the leader of a Russian organized crime syndicate in the seventh season of Dexter. Isaac comes to Miami to determine who killed one of his associates. Are you satisfied from choice of Ray Stevenson for this role? And, which female actor would you love to see playing the major reccuring guest star role of Detective Angie Miller? Tell us your suggestions in the comment section! I'd love to see Lost's Michael Emerson as a villain. As for the role of Dt. Angie Miller, I want a big hollywood name. Like Julia Roberts. i think that they're preparing us for something huge regarding the casting of Dt. Miller. Willem Dafoe as a villian fa sho!! Sylvester Stallone. He is Dexter fan. I think Robert Pattinson could pull off Detective Miller for sure. I like Sanaa Lathan for the role of Det. Angie Miller. She fits the description very well, I think. Of course it all depends on how important the role is. For Angie Miller I think we are looking for a strong competent black female cop, but also this is Dexter, so she needs to be cute and funny at times too! So this is easy: Gabrielle Union - if she can hold her own with Damien Lewis and Donal Logue, she should be able to hold her own with MCH and JC. It would be ironic if they made Gerard Butler a bad guy on Dexter. As for female playing Det. Angie Miller I would like to see Halle Berry play it. John Heder should be the next major villain. The sound track for the whole season could be composed by John Swilhart on an old electric organ. I would like to see Rose Mcgowan. I think Terry O'Quinn (from Lost and the X-Files Movie) would make a great FBI agent who starts to figure Dexter out like Special Agent Lundy did. ... or maybe if Dexter ever goes to trial, he would make a great prosecutor. they should bring back astor and cody! Have justin bieber as a murder who Dexter would have to kill. That would be fun to watch. I would love to see more Mos Def. He was phenomenal. I heard he was going to be in season 6, so I watched Dexter all the way through just so I could see him. Then I fell in love with the show, now i'm addicted. *Sigh. But I think the ghost of Brother Sam would really be great. Bring back Lundy! Killing off Lundy was a waste! Brian's dead and he was back and heck Harry's been dead the whole time! But Lundy has no significance to Dexter. He was there to help Deb mature, so I don't know why Dexter would start seeing him. Yvonne Strahovski as Detective Angie Miller....she would definitely fit in ! Isn't Det. Miller supposed to be African-American? Yvonne strahovski or Sarah Michelle Gellar !